Never before has adding your own sounds to your drumset or percussion rig been this easy. The SamplePad is a compact four-pad instrument that gives you access to a limitless palette of sounds. With 25 percussion and electronic drum sounds built in, and the ability to load any sounds you like using a standard SD card. The SamplePad put the sounds you need on its great-feeling pads. Add a external trigger input for a trigger or switch pedal and the ability to mount on virtually any snare stand or rack, and the SamplePad makes expanding your setup easy as ever. The SamplePad will fit almost anywhere, so it’s perfect for musicians who want to incorporate sampled sounds into their setups. It’s just like adding another drum to your rig. Just mount the SamplePad on a standard snare drum stand or connect it to any stand or rack using the Alesis Module Mount (sold separately). 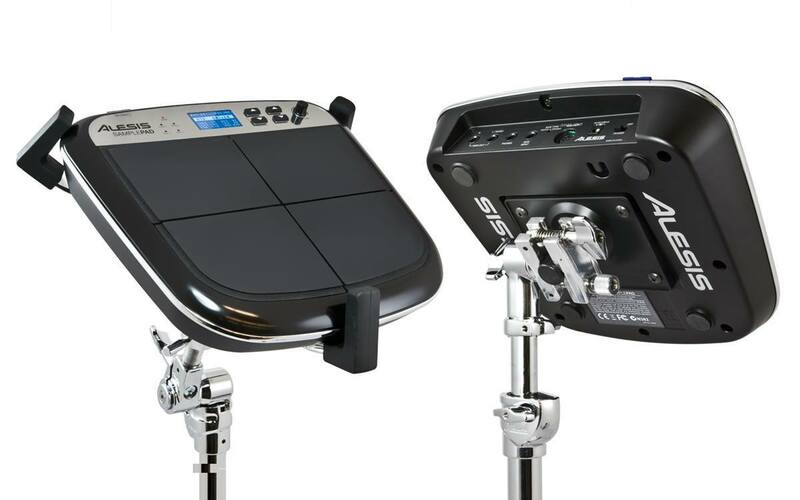 In addition, for studio use, the SamplePad can simply be placed on a tabletop. The SamplePad is just the opposite of hard to use multi-percussion units. It’s designed to be small, self-contained and easy to use, offering just what you need and nothing you don’t. It gives you access to hundreds of your own sounds, plus 25 in-demand drum sounds. All this while adding virtually nothing to your set-up time. The SamplePad comes equipped with a collection of acoustic and electronic drum and percussion sounds that are perfectly suited to the needs of drummers and percussionists. These sounds are standards in any drummer’s toolbox, and you can mix and match them with your own samples, assigning each to the pad you choose or to the kick input. In addition, You’ll find ready-to-play acoustic and electronic drums and percussion from Latin America and Asia that are perfect for your drums. 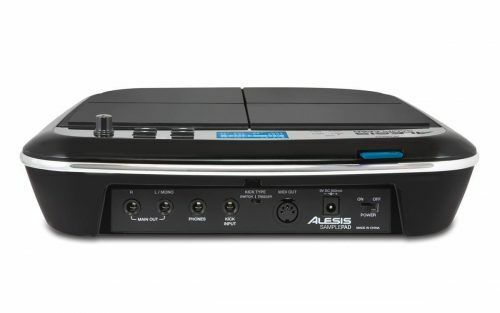 Connect the SamplePad to an amplifier, PA or recording system using its standard dual 1/4-inch outputs, and monitor on your favorite headphones. The kick input works with most pads and triggers including the DMPad and RealHead Kick Pads. With the SamplePad’s easy-to-use interface, it’s easy to find the sound your looking for. Simply strike the pad you want to change, dial to the sound you want and you’re done. If you discover a great combination of sounds you want to keep together, simply designate it as a kit and the SamplePad will save it for easy recall anytime you want. 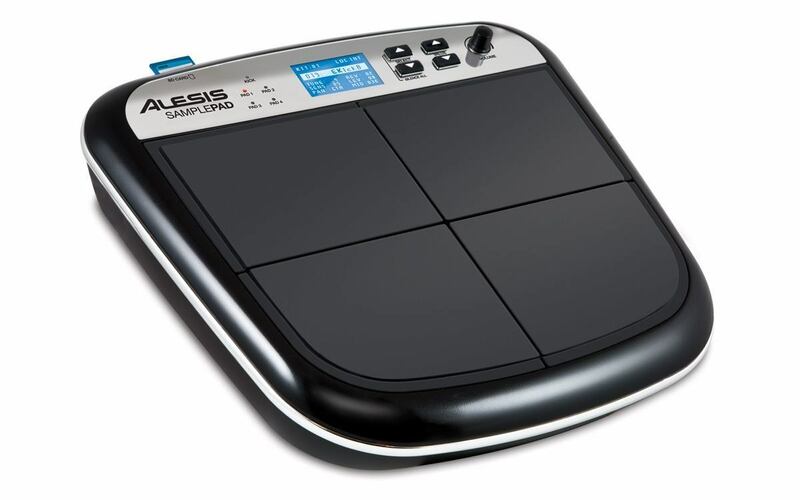 Give your kit some personality with the SamplePad, only from Alesis. 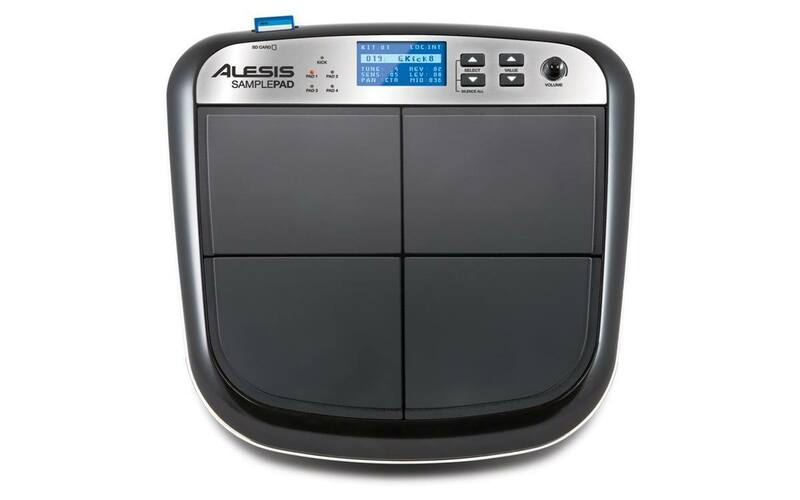 *Mountable to a stand or rack using the Alesis Module Mount (sold separately).